Founded in 1965 by Robert (Bob) Ireland, Guelph Manufacturing opened for business as Guelph Tool Company, a machine job shop servicing local industry with machining work, building tools, dies, jigs and fixtures. Guelph Tool grew steadily over the years, the result of exceptional quality that customers were eager to share. As the business grew, Bob welcomed the opportunity to expand into manufacturing. In 1978 the company’s first automotive contract was awarded from General Motors. From that initial opportunity through the 1980’s the company grew its automotive OEM customers, while maintaining and growing an automotive Tier One customer base. 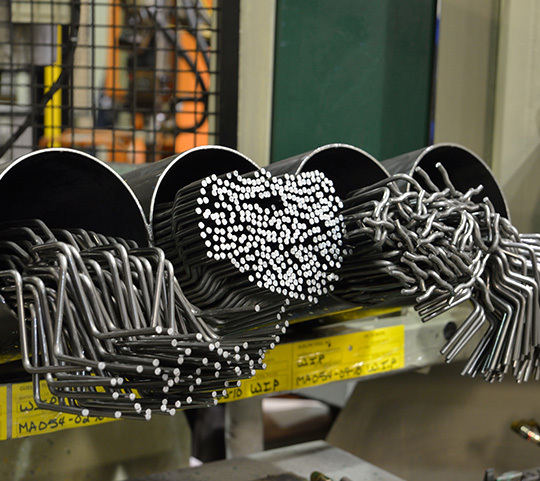 Guelph Tool began adding products and developed a niche for forming wire, rod and steel tubing, which includes products like our seat frames and headrest inserts. The company also added manufacturing capabilities such as assembly and welding. Through the 1990’s and early 2000’s the company continued to grow, adding capabilities such as automation, robotics and CNC. Shortly after, in 2006, the company opened a 90,000 sq. foot heavy stamping facility in Guelph. Now, as Guelph Manufacturing Group, the company continues to expand its capabilities while maintaining the same commitment to quality that Bob Ireland had when founding the company more than 50 years ago. Guelph Manufacturing is committed to delivering on our customers’ business needs by providing superior product quality and industry-leading services. Guelph’s leadership team has developed its experience in manufacturing and the automotive market segment, with the majority of the leadership having over 25 years of experience. The senior leadership team along with the operational and department heads have been focused on developing strong relationships and a record of quality and service to our long standing customers. The diverse leadership team is well versed on the requirements and expectations of the industry and continues to lead the organization to accomplish our corporate objectives. Guelph has 3 manufacturing plants in Ontario, Canada, a plant in Atlanta, Georgia, and a sales and distribution center in Warren, Michigan. From this footprint we interface with customers and suppliers from around the world including, Mexico, Brazil, Germany, China, Slovenia and various others. From our dedicated manufacturing facilities, to our strategic partnerships that serve customers wherever they are in the world, Guelph can reach you. With a commitment to excellence throughout every part of the organization, Guelph Manufacturing has built a reputation for providing our customers with an enhanced level of quality and service in everything we do.